This smaller, traditional beauty features large arched windows, round columns, covered porch, brick veneer, and an open floor plan. Clerestory dormers above the covered porch light the foyer which leads to the great room with cathedral ceiling and fireplace. 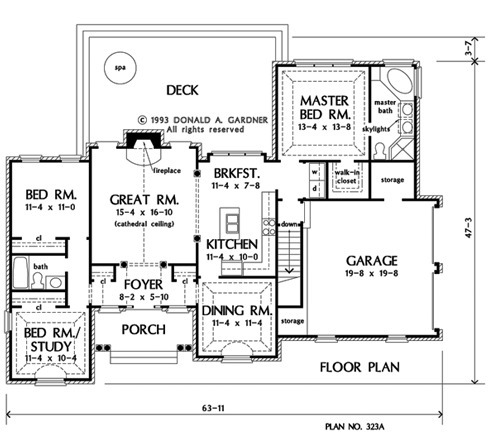 The great room opens to the island kitchen with breakfast area and accesses a large deck with optional spa. Columns define the spaces. Tray ceilings lift the master bedroom, dining room, and bedroom/study out of the ordinary. The luxurious master bath features double vanity, separate shower, and whirlpool tub. House Dimensions: 60' 6" x 47' 3"
Foyer (Vaulted): 8' 2" x 5' 10" x 17' 2"
Great Room (Cathedral): 15' 4" x 16' 10" x 16' 2"
Breakfast Room : 11' 4" x 7' 8" x 8' 0"
Master Bedroom (Tray): 13' 4" x 13' 8" x 9' 7"
Porch - Front : 15' 4" x 6' 7" x 0' 0"
Deck / Patio : 27' 4" x 17' 7" x 0' 0"